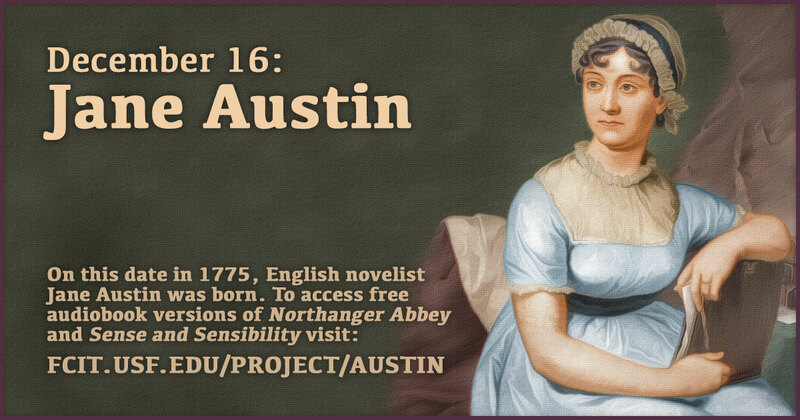 On this date in 1775, English novelist Jane Austin was born. 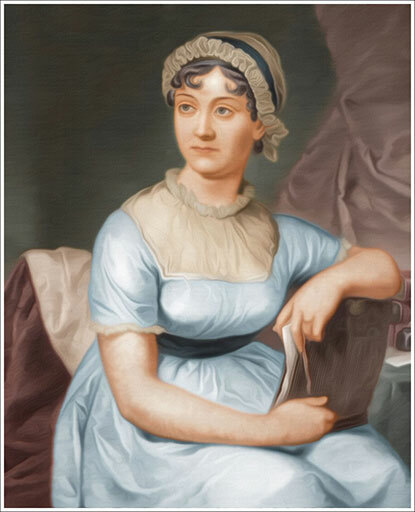 Jane Austen’s use of biting irony, along with her realism and social commentary, have earned her great and historical importance to critics and scholars. Enjoy our two Lit2Go audiobooks: Northanger Abbey and Sense and Sensibility. Use this banner on social media to celebrate share our Lit2Go audiobooks by Jane Austin. 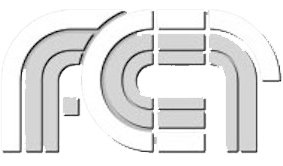 Illustration of Jane Austin by the Florida Center for Instructional Technology. 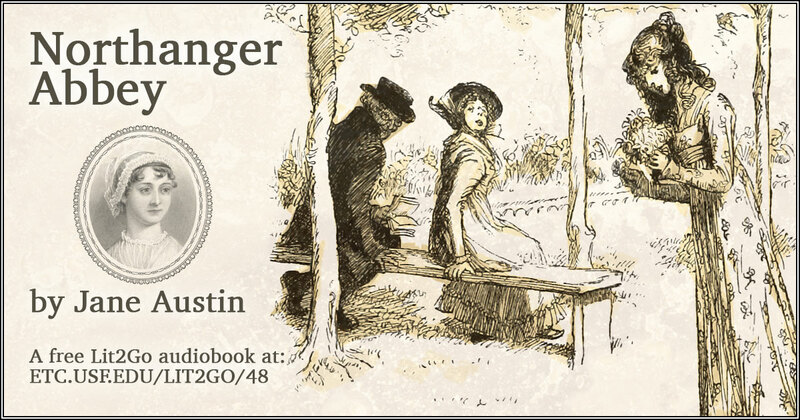 Northanger Abbey audiobook from the Lit2Go website. The novel follows Catherine Morland and family friends Mr. and Mrs. Allen as they visit Bath, England. Seventeen year-old Catherine spends her time visiting newly made friends, like Isabella Thorpe, and going to balls. Catherine finds herself pursued by Isabella’s brother John Thorpe and by Henry Tilney. She also becomes friends with Eleanor Tilney, Henry’s younger sister. Mr. Henry Tilney captivates her with his view on novels and knowledge of history and the world. The Tilneys invite Catherine to visit their father’s estate, Northanger Abbey, which, because she has been reading Ann Radcliffe’s gothic novel The Mysteries of Udolpho, Catherine expects to be dark, ancient and full of fantastical mystery. 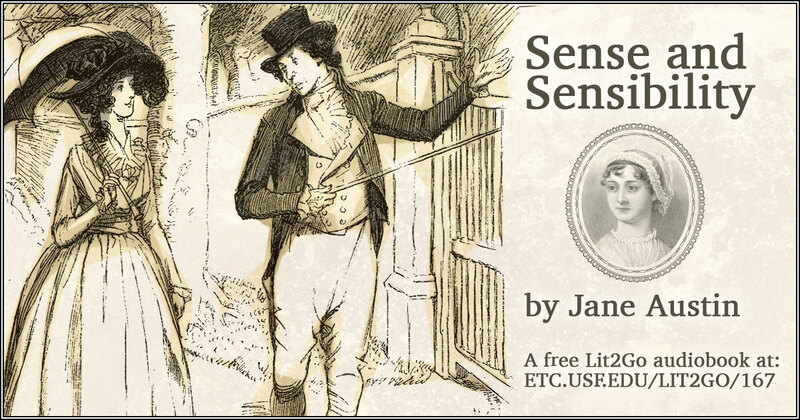 Sense and Sensibility audiobook from the Lit2Go website. This novel of manners and societal expectations concerns two sisters, Elinor and Marianne Dashwood (Elinor representing “sense” and Marianne “sensibility”). Along with their mother and younger sister Margaret, they are left impoverished after the death of their father. The family is forced to move to a country cottage, offered to them by a generous relative. Before the move, Elinor forms an attachment to Edward Ferrars, and after the move, Marianne forms one for John Willoughby. These attachments lead to problems both personally and socially, and they must learn important lessons about themselves before resolutions can occur.